So says Maya the cow in “Wisdom,” the poem that opens “Our Farm: By the Animals of Farm Sanctuary” (Knopf, February 2010). As readers explore this book of poems for children (and adults, too! ), they will meet not only the venerable and maternal Maya but also the chivalrous rooster Mayfly, the exuberant piglet J.D., the grateful sheep Hilda, and many other animals who live or have lived at Farm Sanctuary’s New York and California Shelters. “I wanted to communicate the soulfulness of the [animals] so that children and their caretakers could relate to them as fellow sentient beings, with individual personalities, thoughts and feelings like their own,” says Maya Gottfried, who was inspired to write “Our Farm” after volunteering for Farm Sanctuary. Accompanied by the richly colored and detailed paintings of Robert Rahway Zakanitch, Gottfried’s poems vividly evoke the voices of pigs, goats, ducklings, chickens, and other farm animals, whom readers will want to revisit again and again. 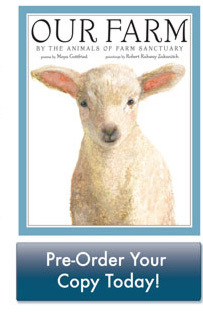 Everyone will fall in love with both the affectionate writing and irresistible animal illustrations found on the pages of “Our Farm.” As a classroom tool to inspire compassion, a gift for a special child in your life, or a keepsake of your own, this is one book you’ll definitely want to get your hands on. “Our Farm” is coming soon! The official release date is February 9, but you can pre-order this beautiful book now. Farm Sanctuary Shop purchases support our lifesaving efforts, so help suffering farm animals by getting your copy of “Our Farm” through us today!